Just to see, I tried making almond flour in my Kitchen Aid brand food processor . The dark, on the top, is the almond 'flour' (it's more a cornmeal texture) that I made in my food processor with the standard metal knife blade, the bottom lighter flour (because it's been in my freezer) is what my friend and I made in her Vitamix. 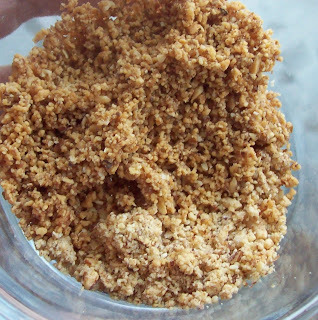 I honestly am pretty pleased with my food-processor for making this almond flour. With the Vitamix we had to process the almonds at just the right speed, about one cup at a time. In my food processor I filled the bowl about 2/3 full and just let it whir for a few minutes. My food processor almond flour is a little more coarse than what the Vitamix did, but it worked for us. My food processor didn't make almond butter out of just the almonds (the Vitamix can), so I added about a tablespoon of coconut oil. 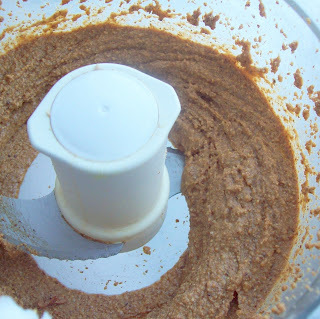 It did make a 'crunchy' almond butter that we love with the coconut oil. About one tablespoon to 4 cups of almonds. We used the soaked then dehydrated almonds that I did a few weeks back. No doubt the Vitamix would make better smoothies, but I'm just fine with sticking with my food processor now. That seems almost like blasphemy with home cooks; I hear about how much everyone loves their Vitamix all the time. Am I the only one who thinks that maybe a Vitamix isn't worth the price? Or do you love yours to death? Naturoli: Natural laundry soap for pennies a load! 0 Response to "Make Almond flour (meal) in the food processor"